The combination of post office and barber shop (now the Village Pump) was erected by Gus Kelley in 1890. It was originally to have been a one story structure, however, Mr. Kelley was urged by the townspeople to add a second floor for a social hall. In March 1893, just three years after the completion of the post office, the west side of the building caught fire. The results could have been disastrous if it had not been for a man trimming grapes nearby who saw what was happening and summoned the bucket brigade. The fire was therefore quickly brought under control.the fall of 1904, Misses Edne Schlumbohm and Lydia Michaels opened a dress making establishment in the post office building. In 1914, Dr J.G. Griffin, who was one of the two doctors serving Kelleys Island at that time, had his office located in the post office building. At the same time, Delbert Carstensen was operating a barber shop in the building. Sometime after prohibtion, the Martin Family acquired the first liquor license on Kelleys Island, establishing Martin's Bar. Parney and Del McCune purchased Martin's Bar in 1956. 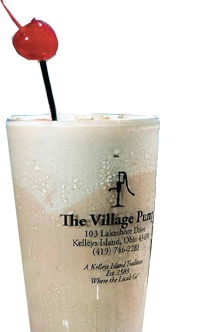 Wayne and Michelle Finger purchased the bar in 1969, thus changing the name to The Village Pump. Gary and Jackie Finger purchased the bar in September 1983. This year marks the 33rd year for Gary, Jackie and the renowned Pump Crew at the helm holding true the same family traditions of the past Island generations. Gary graduated from high school on Kelleys Island in 1976 in a class of two. Jackie graduated from Medina in 1978, after her first year of college she came to Kelleys for her grandparents 25th wedding anniversary, Ron & Lydia Bechtel. Jackie met Gary here on Kelleys that day. The two were married in 1982 and bought the bar in 1983. This is their 33rd year owning and at the helm of the Village Pump. Jackie's grandmother, Lydia Bechtel was a born and a rasied Islander. Gary's brother, Wayne Finger and Sister-in-law Michelle McCune owned the bar from 69-83 when Gary and Jackie bought the bar. Gary's father and mother, Bill and Alice Finger, bought the Bayview Cottage Hotel and Dock in 1970 from the Overcash Family, which is Gary and Jackie's home today.